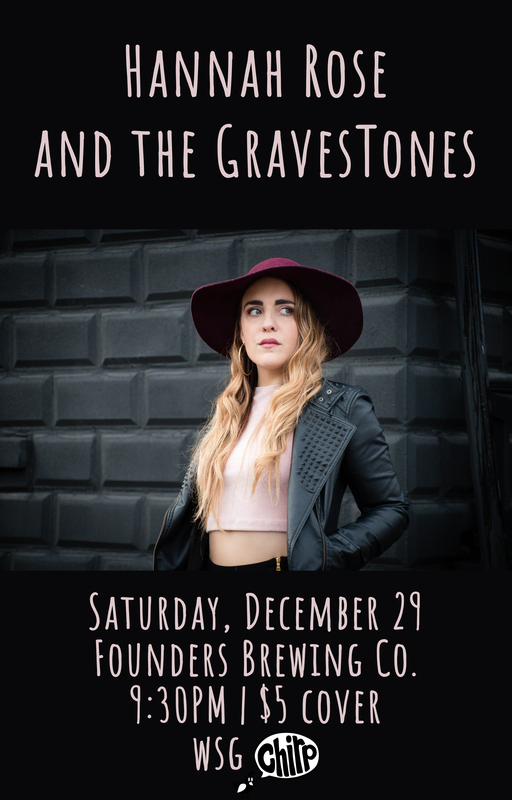 Hannah Rose and the GravesTones - Founders Brewing Co.
Hannah Rose Birthday Bash and single “Glitter and Dirt” release party! You don’t want to miss this! “The blood, sweat and tears of an ambitious first-time endeavor show up in so many of the songs that unfold on “Everything We Already Knew.” This is music with a fiery soul. You can hear it in the lyrics, in the emotion-drenched voice of Grand Rapids singer Hannah Rose Graves, in the intricate and intense guitar solos of Justin Wierenga. But mostly this debut by Graves and her longtime guitarist (recorded at Matt Ten Clay’s Amber Lit Audio in Grand Rapids) is a much-anticipated showcase of the singer’s soulful, bluesy approach on a diverse batch of original songs – many of which audiences have embraced for years at jam-packed venues such as Billy’s Lounge, Founders Brewing and SpeakEZ Lounge and some of which hold promise as fetching, radio-friendly singles. More important, it’s the sort of project that could serve as a launching pad, heralding even more fruitful endeavors to come. Chirp has been hard at work since their formation in 2015, playing over 200 shows in 3 years. Their fresh sound has taken them across Michigan and the Midwest to play a large variety of venues and festivals. In addition to several live sets from shows, Chirp has released three live-recorded EPs: “Live from Brownstown” (in-studio, 2016), “Live at Willis Sound” (in-studio, 2017), and “Live at Ann Arbor Summer Festival” (2018). All of which have been met with great reception and have helped along with live performances to build an extremely enthusiastic fan base. Chirp is Jay Frydenlund, Brian Long, Ken Ball, and John Gorine. Accomplishments: WUMD Radio Battle of The Bands Winner (2018). Performed with Andre Foxxe of Parliament-Funkadelic (2018). Performed at Michigan Peace Festival (2018 headline), Sacred Vibes Music Festival (2017, 18), Buttermilk Jamboree (2018), Ann Arbor Summer Festival (2018), Sweetgrass & Sage Burn Music Festival (2017, 18 headliner), Broken Branch Breakdown (2018 headliner). They have shared the stage with Papadosio, Moon Hooch, Mustard Plug, Joshua Davis, May Erlewine, Broccoli Samurai, Joe Hertler & The Rainbow Seekers, Mister F, Earphorik, Ott, The Macpodz, Marbin, Groovement, Dixon’s Violin, Of The Trees, EGi, The Jauntee, Desmond Jones and more.